This rule says a power of two multiplied by a power of two is a power of two. In particular, the resulting power of two has an exponent equal to the sum of the exponents of the multiplied powers of two. This rule says a power of two divided by a power of two is a power of two. In particular, the resulting power of two has an exponent equal to the dividend’s exponent minus the divisor’s exponent. This rule says a power of two raised to a power is a power of two. In particular, the resulting power of two has an exponent equal to the product of the two given exponents. In the general laws of exponents there are two additional rules: the power of a product rule and the power of a quotient rule. For powers of two, these rules become unnecessary, as they can be derived from the rules above. Nonetheless, they are still valid, and can provide a shortcut in calculations if you’re so inclined. This rule is just the combination of the product of powers of two rule and the power of a power of two rule. This rule is just the combination of the quotient of powers of two rule and the power of a power of two rule. 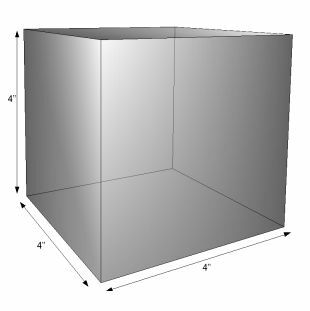 A 4" x 4" x 4" cube.